Some time ago, I saw a pattern for a crayon wallet for sale. I stubbornly thought, “There is no way I am paying $7 for a pattern that is certainly just a bunch of rectangles! I can figure this out.” Turns out, I maybe should have bought the pattern. It was more complicated than I imagined. So, here is my tutorial for FREE so you don’t have to endure the same torture of tweaking and changing and making 6 mock-ups like I did! Here is your happy short-cut in the process! 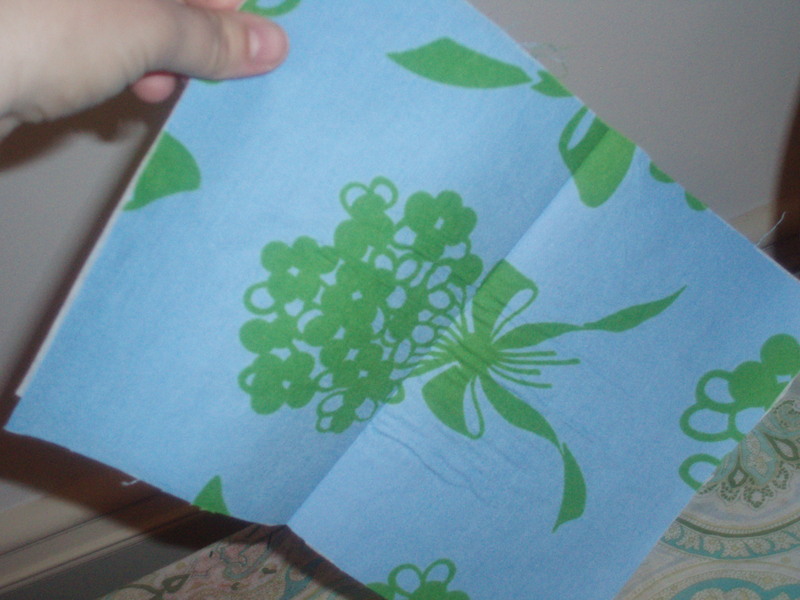 Cut one 6″ x 6″ square of your contrast fabric. 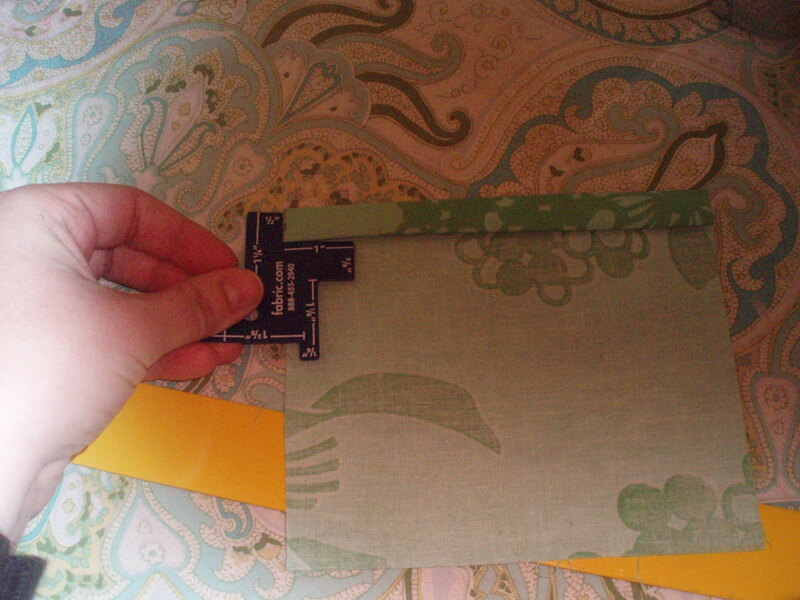 Cut one 14″ x 5″ rectangle of your contrast fabric. 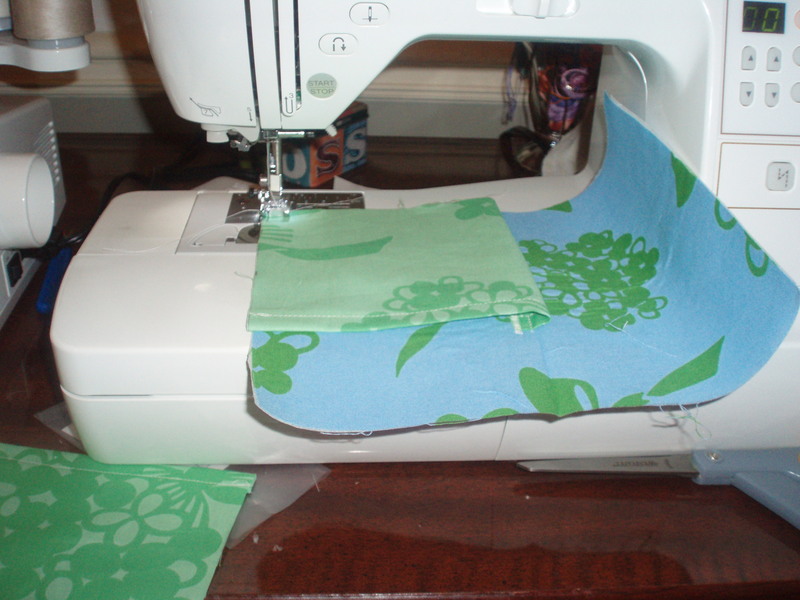 Cut two 10″ x 7″ rectangles of your main fabric. 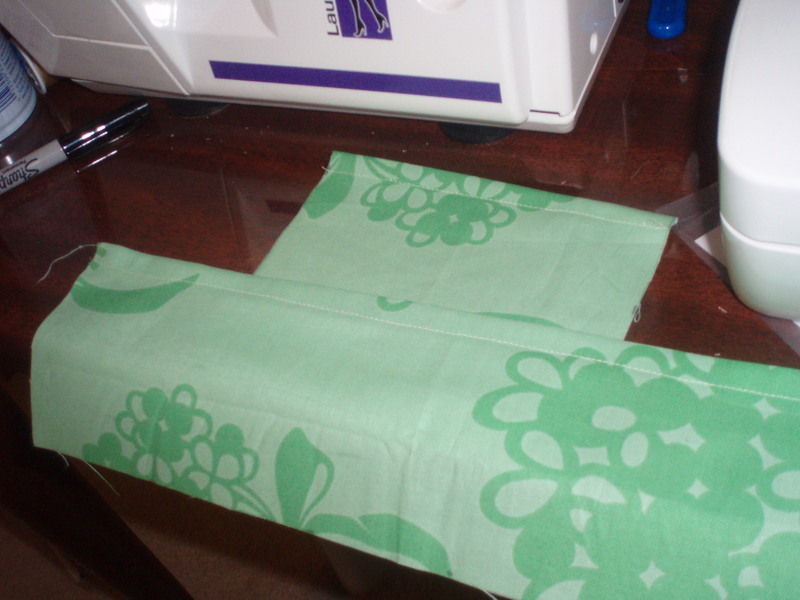 Cut two 10″ x 7″ rectangles of heavy weight fusible interfacing. If you are adding a snap, you’ll need to mark the front snap placement. The snap should be 3.5″ from the top (of the right 7″ side) and 1″ in. 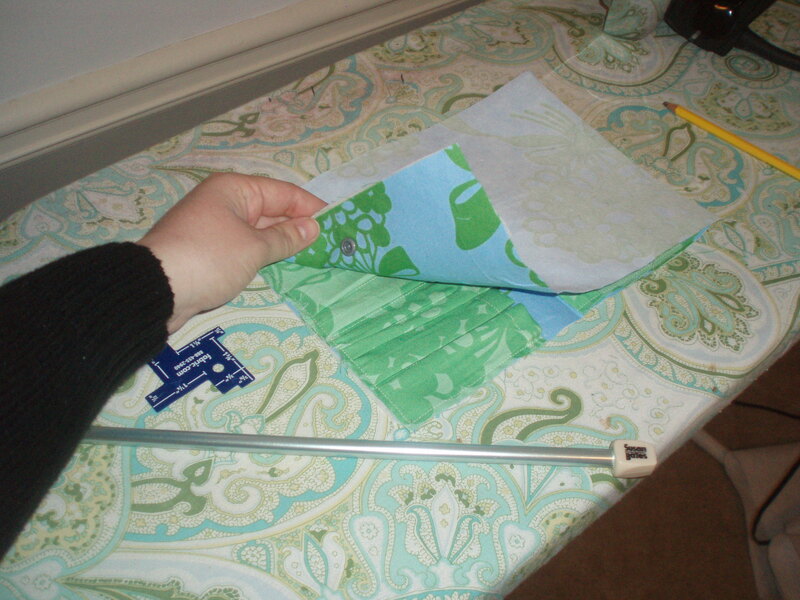 Mark your spot, use awl or pointed object to poke a hole in the fabric at that spot. 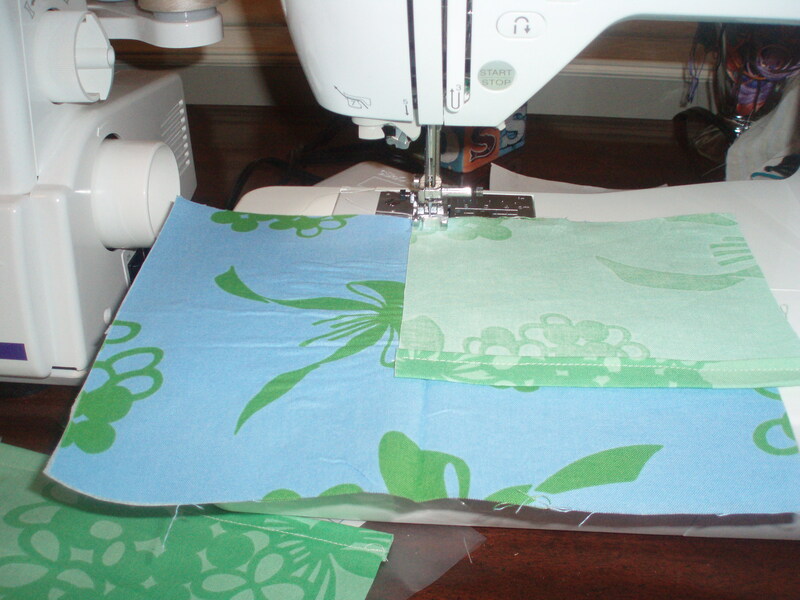 Using a snap press or snap pliers, apply a snap to the marked spot with the cap of the snap on the interfaced side (will be the inside) and the snapping part on the right side of the fabric. This 10″ x 7″ rectangle will be the outside of your wallet. 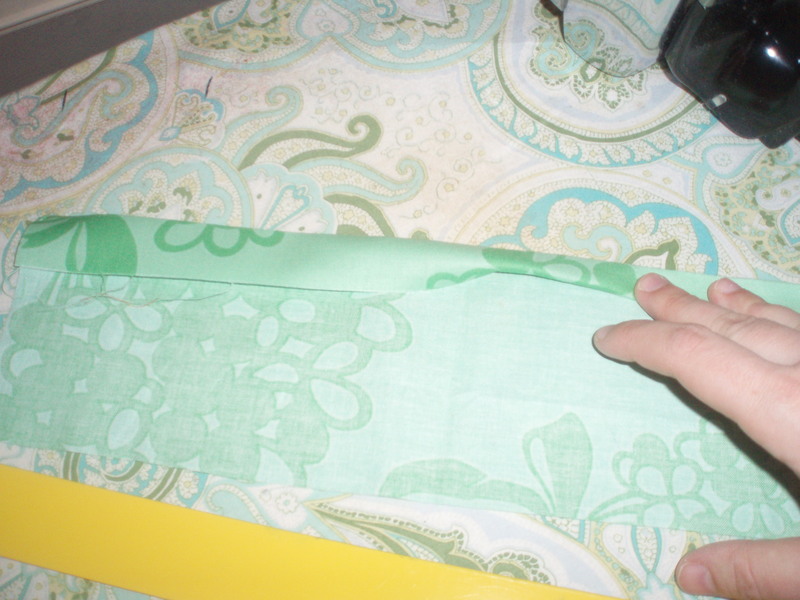 With the 6″ square and 14″ x 5″ rectangle of contrast fabric, make a half inch double fold hem on one edge. (A 14″ edge of the rectangle.) 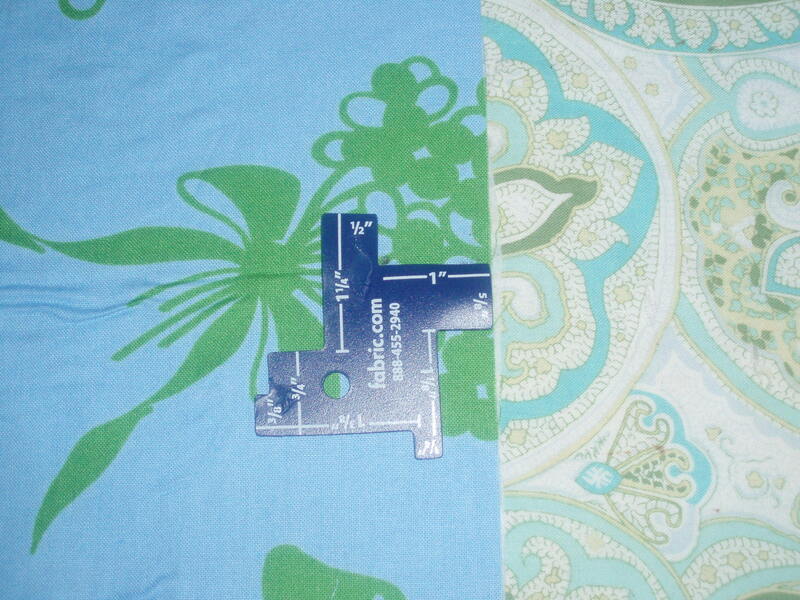 To make a double fold hem, press down 1″. 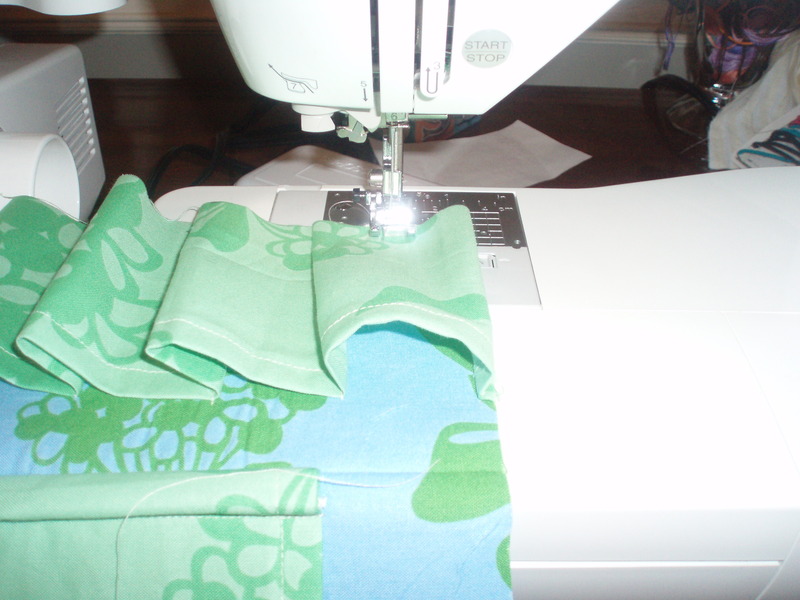 Turn fabric edge under and press 1/2″ under. Seam is now 1/2″. Sew along the edge to finish. 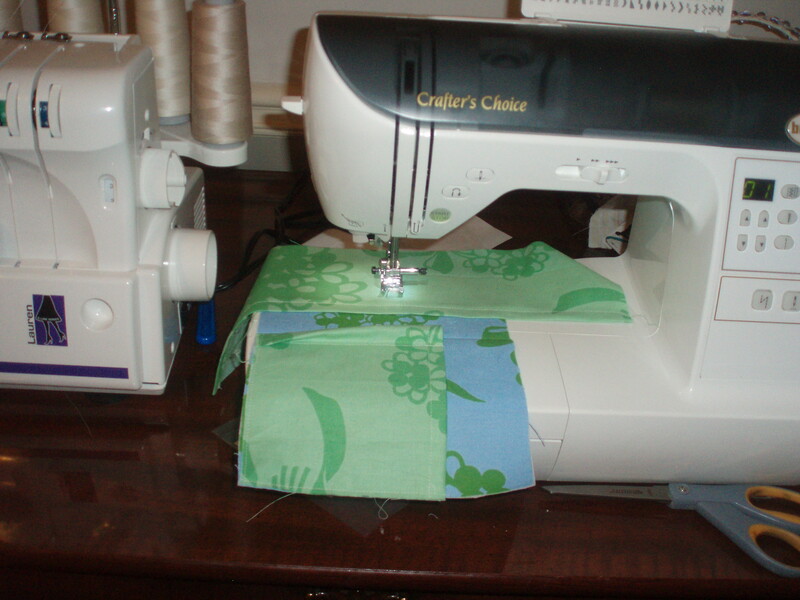 I sew a straight stitch down the center. 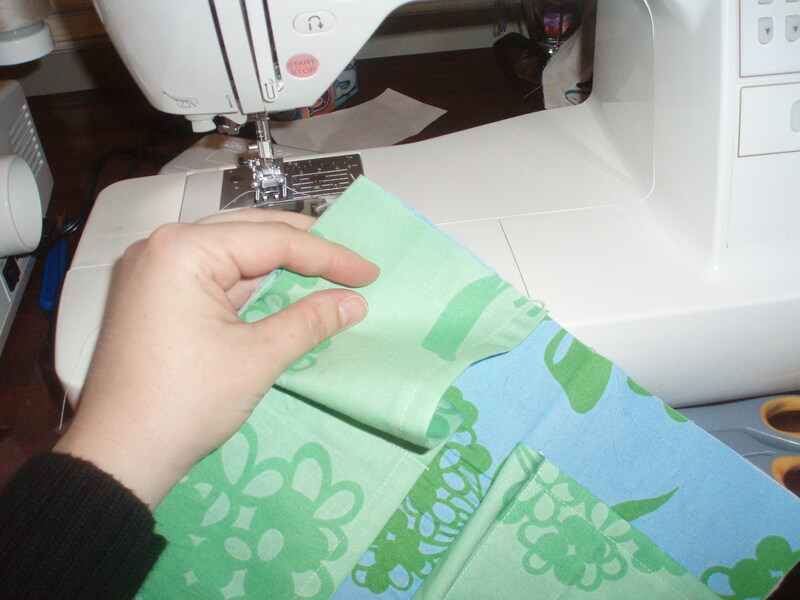 Then, I zig-zag over the raw edge of the pocket- further securing it and making it look neat and tidy. As you can see in the picture above, the wrong side of the fabric is showing. We’re going to flip the pocket to the right and it will look fabulous! Keep reading. 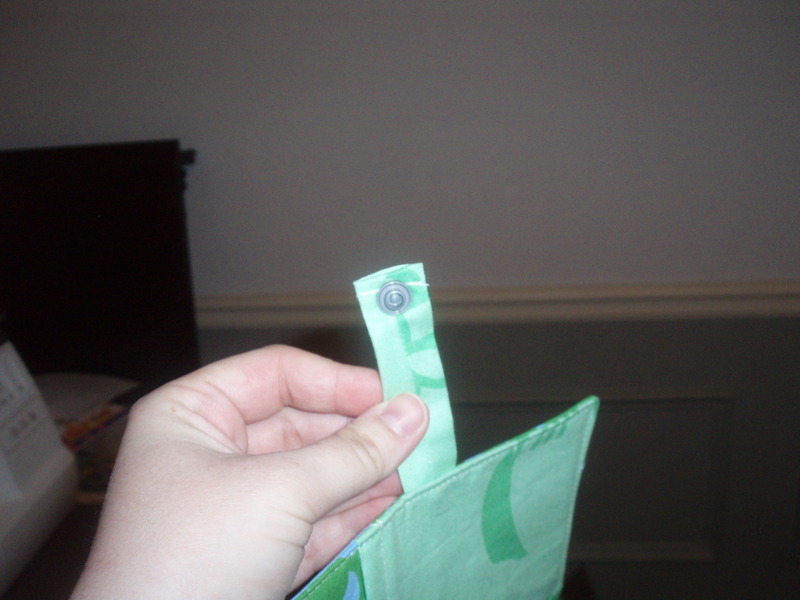 Flip the pocket over so the right side is now showing. Line up the edge of the pocket with the edge of your main fabric. 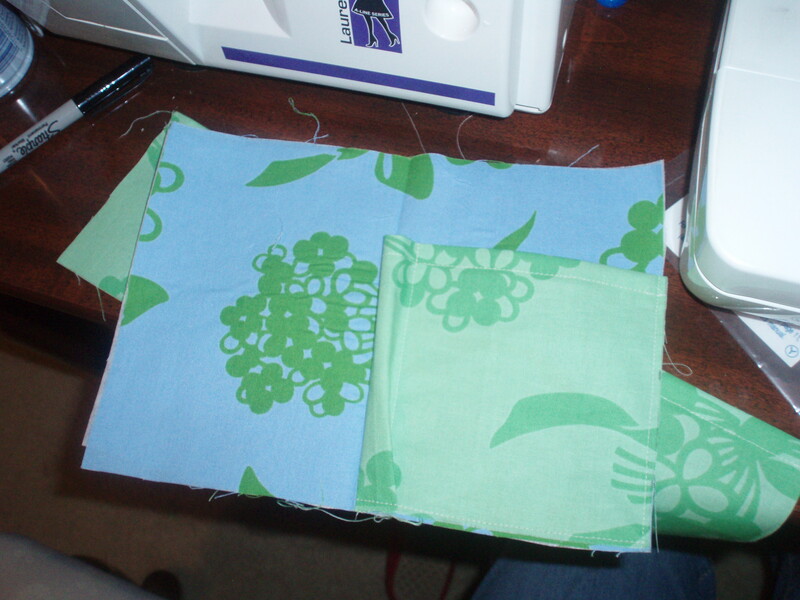 Sew the pocket down close to the edge. 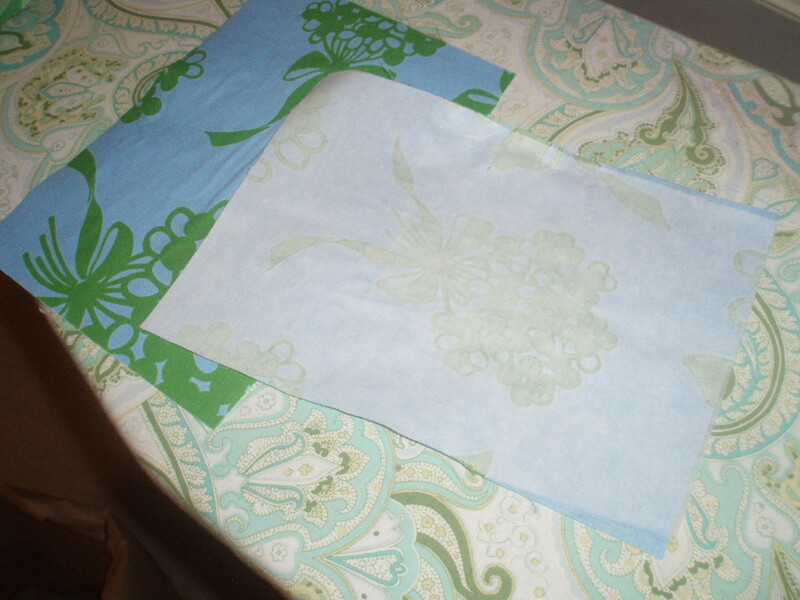 This seam will get covered later, so don’t worry with backstitching or enclosing the edges. Notice, the square pocket is not a perfect fit. Resist the urge to trim it to lay perfectly flat here. The gap is intentional! 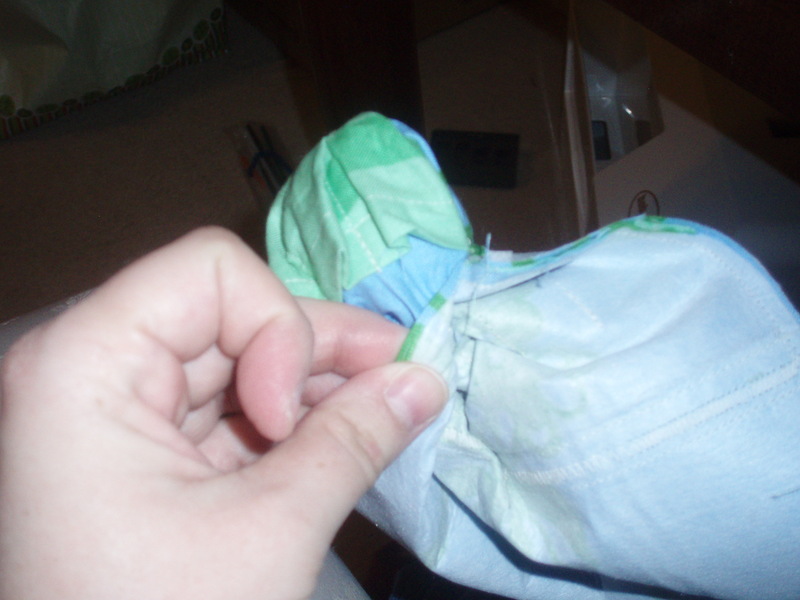 Press all the excess toward the center seam. 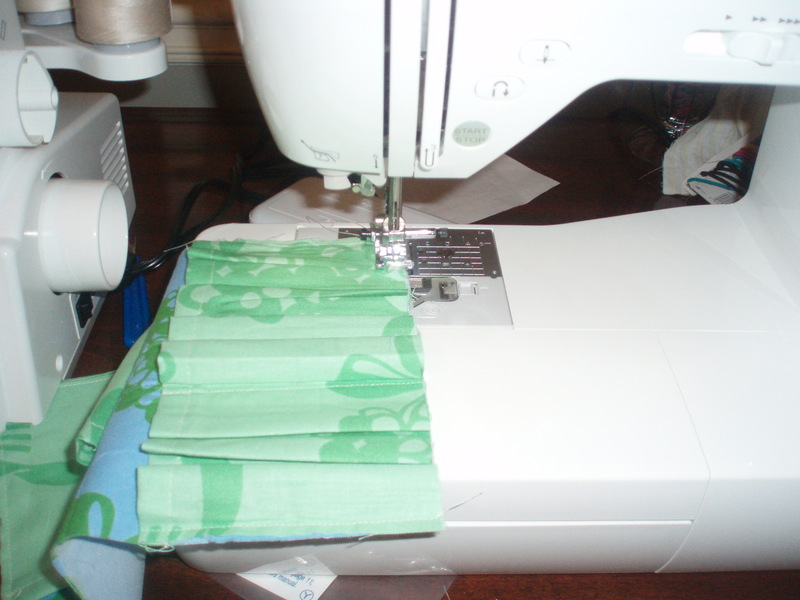 Now, sew (from bottom to top, parallel with the center line) a straight line forming a 1/2″ (you can estimate) mini pocket on the inside of the paper pocket. (This is going to be for a little pencil.) 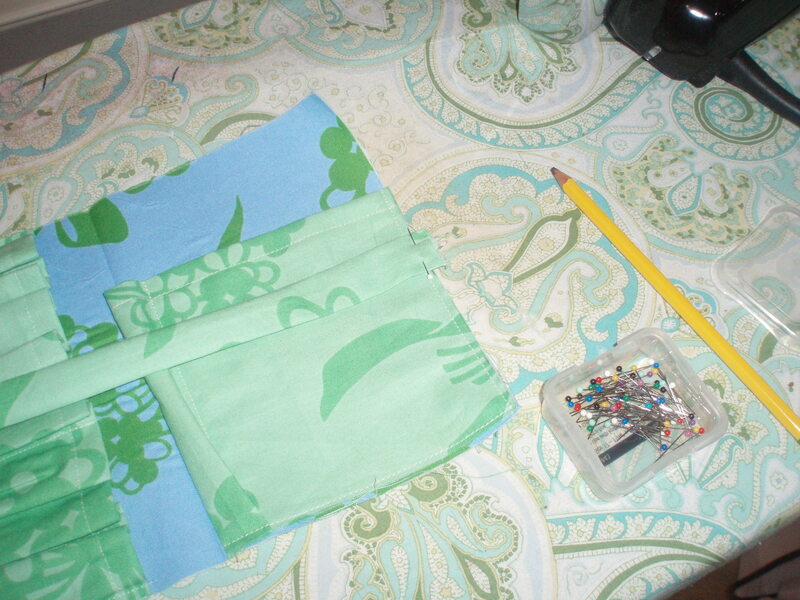 Make sure you backstitch at the top (finished edge) of the pocket. The little excess now needs to be flipped or pleated away from the center seam, then basted down as close to the bottom edge as possible. 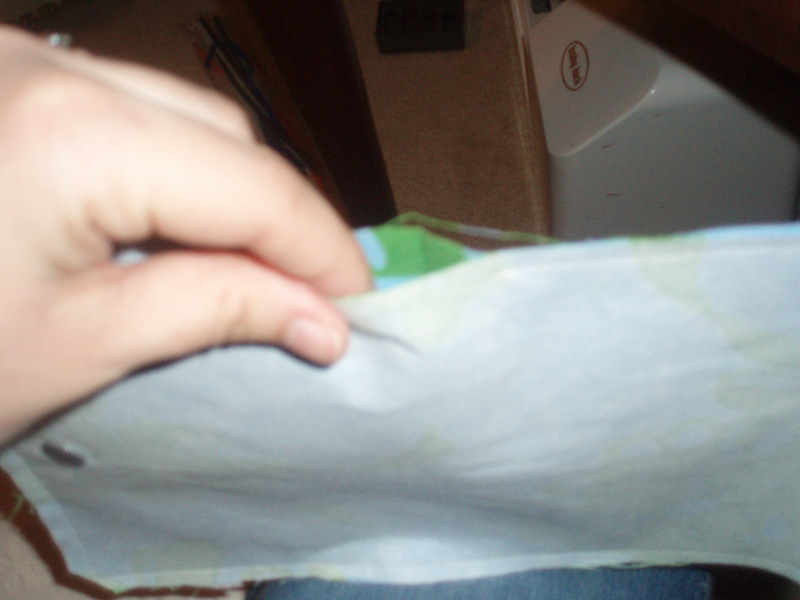 (This seam will be hidden later, so don’t fuss with backstitching or edges.) 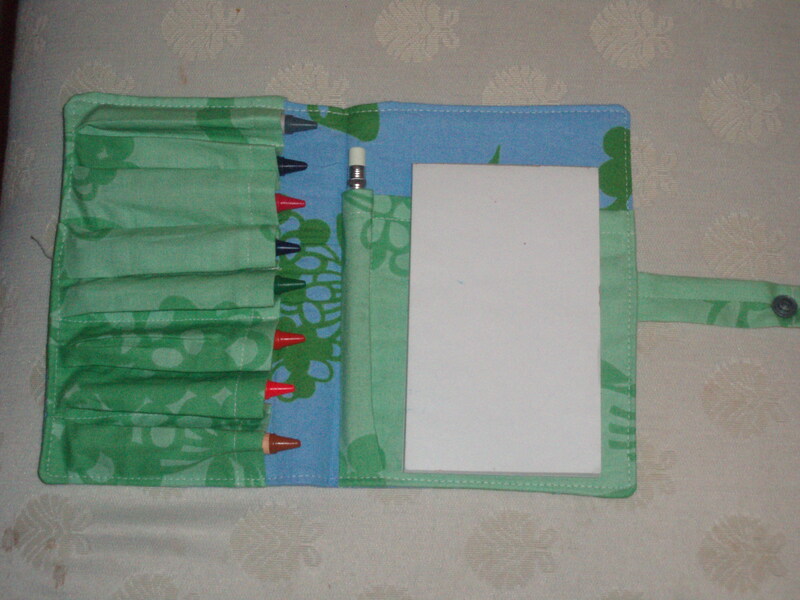 This makes the little pencil pocket pleated, and gives it room so the pencil goes in and comes out easily, making it easy for fat little toddler fingers to both take it out and put it back. We’ll be using the same “technique” with the crayon pockets. Line up the edges of the crayon pocket. Note, the excess fabric is intentional. You’ll need it. Sew close to the edge, securing the edges of the pocket. 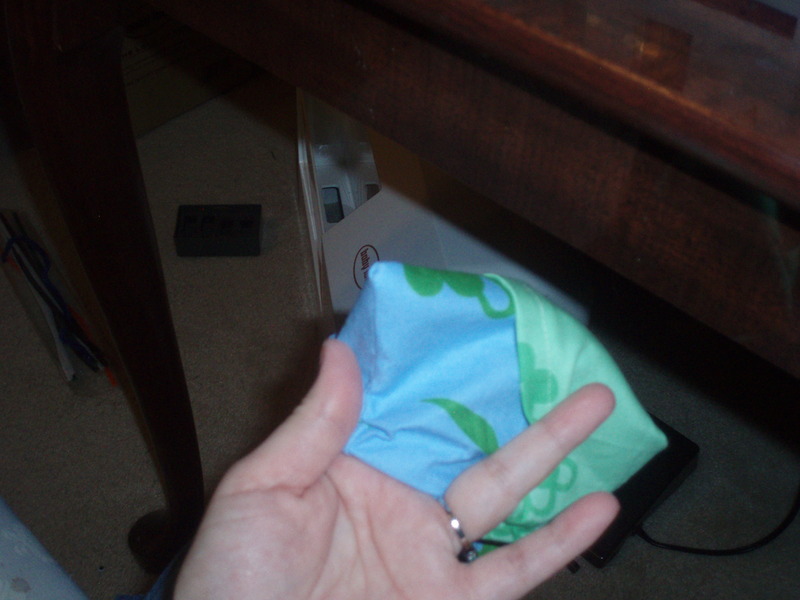 Note that this seam will be hidden later, so there is no need to backstitch or finish the edges of this seam. Just stay as close to the edge as possible while sewing. Do the same with the other side. Now your crayon pocket will look like this! See all that “extra” fabric just hanging around? Let’s keep going and make this thing look like something you might use. Now, you’re going to take it from half to fourths. Eyeball about halfway between the center seam and the edge, pushing the fabric equally toward the center seam and edge seam. If you’re super obsessive, you can measure, but it won’t matter. And if you’re not quite sure, always err toward the center, since the edge will have more removed by seam allowances later. 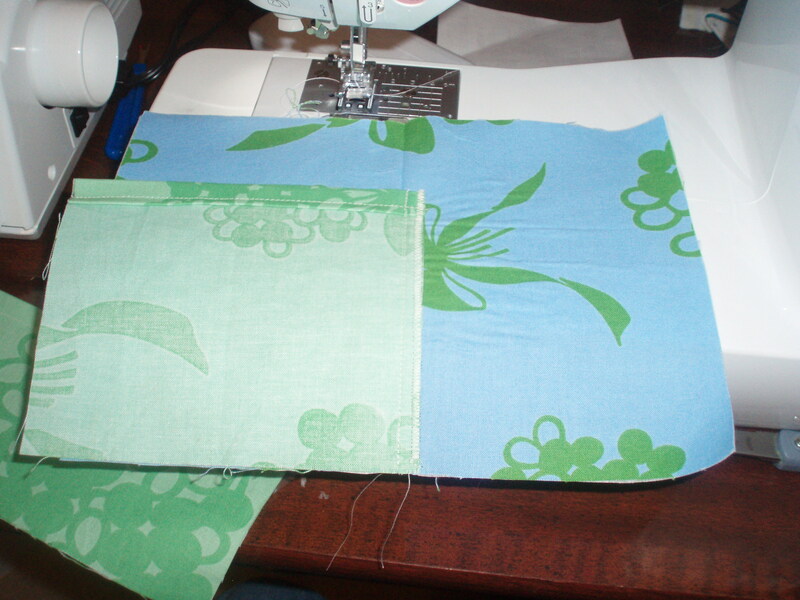 Sew from the outer edge to the finished edge, backstitching at the finished edge. Repeat on the other side! Now your crayon pocket is looking like this. Fun, no? Reminds me of two seagulls holding hands or golden arches side by side or… okay, let’s just move one. Now, we’re going to halve our fourths, creating eighths! Oh, fun with fractions! 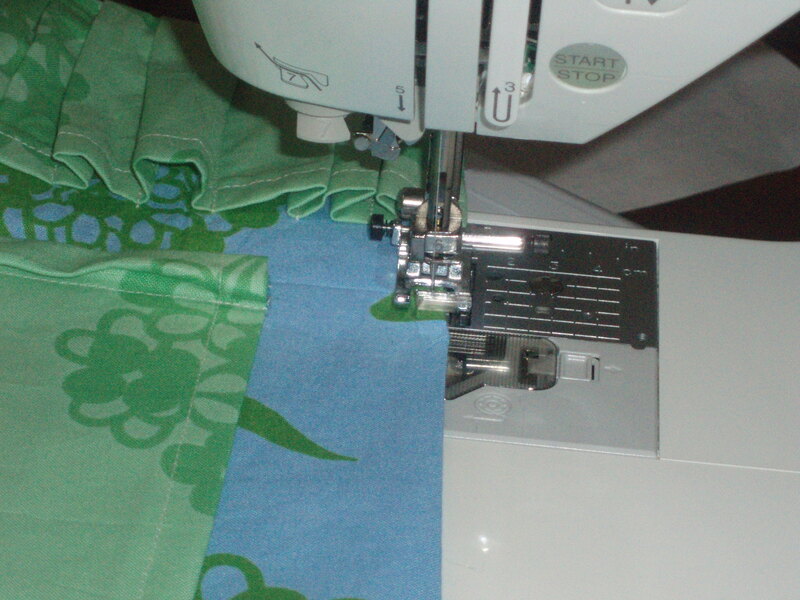 Stitch a seam halfway between each forth, pushing the excess fabric equally in opposite directions. Remember to backstitch at the finished edge. (This edge will take a lot of wear from little ones getting crayons in and out of the pocket, so make sure they are secure! Think of their sad little faces when they bust a seam trying to get their pudgy little fingers all the way down in that little pocket. Now, make sure that doesn’t happen!) 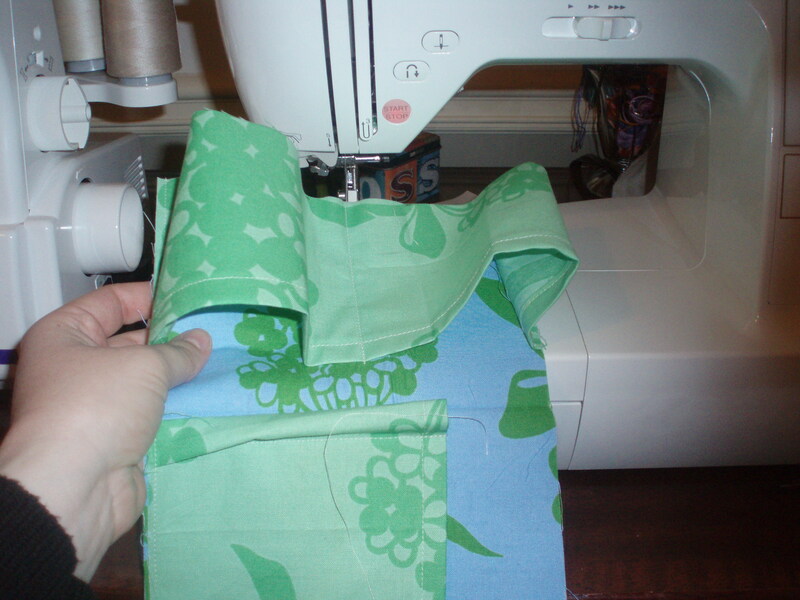 Continue between each forth (erring toward the center seam, if necessary), making 8 little lumps. Your creation should now look something like this. Now, we get to messy pleats!!! Sew (baste) the outer edge of the fabric, securing the pleats. Make sure you stitch as close to the edge as you can. Pin closure in place on the interior. Pin it 3.5″ down the side. (That would be the halfway point.) For this wallet, I made a cloth tab. (It is long in the picture. 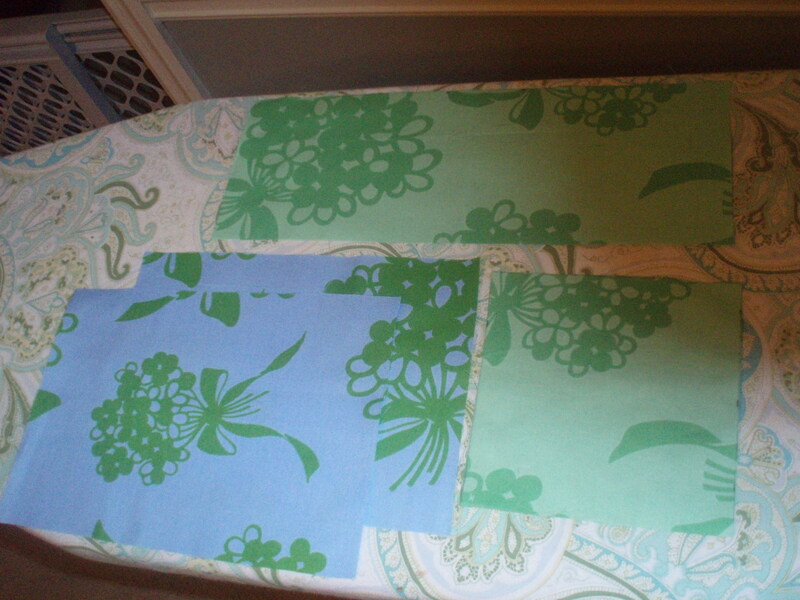 I cut it down and finished the edge after sewing everything up.) 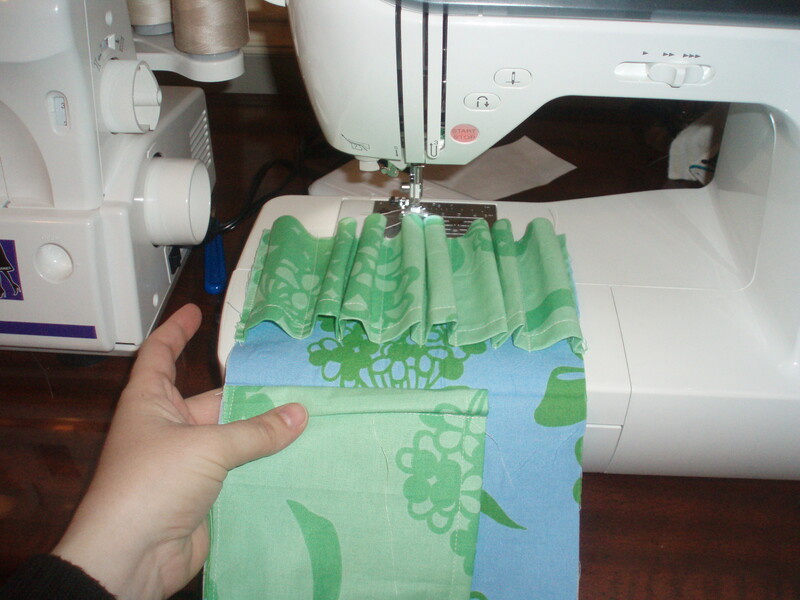 You can place a ponytail elastic here and sew a button to the front when you are done to close your wallet. 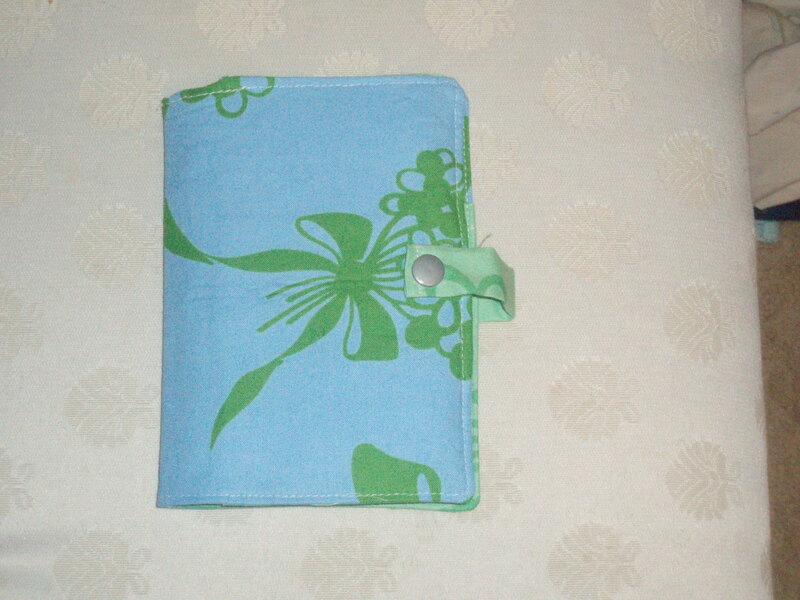 You can sew in a ribbon on each side to tie up your wallet. The details are up to you! 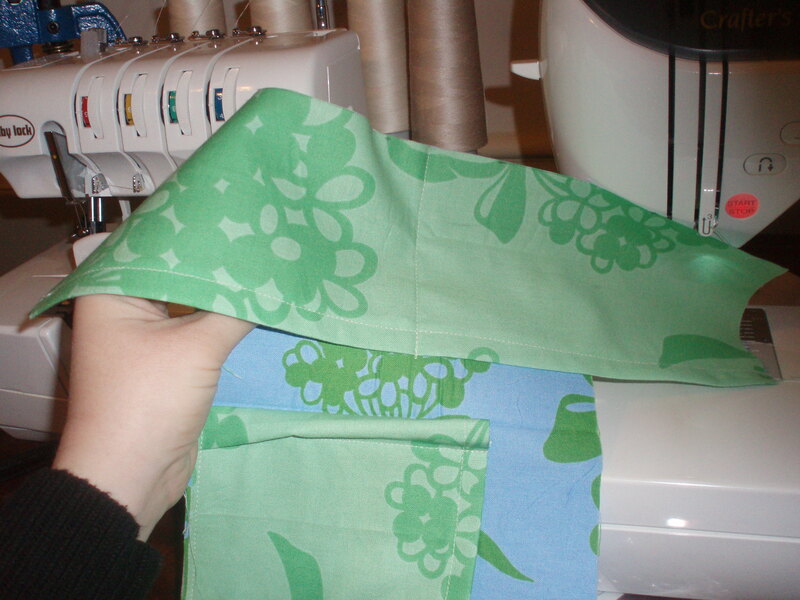 Place your two main fabrics, right sides together. Notice that the snap is to the left. If you’re using snaps, you’ll need to keep in mind which way these go, or you’ll end up with snaps in unusable places. 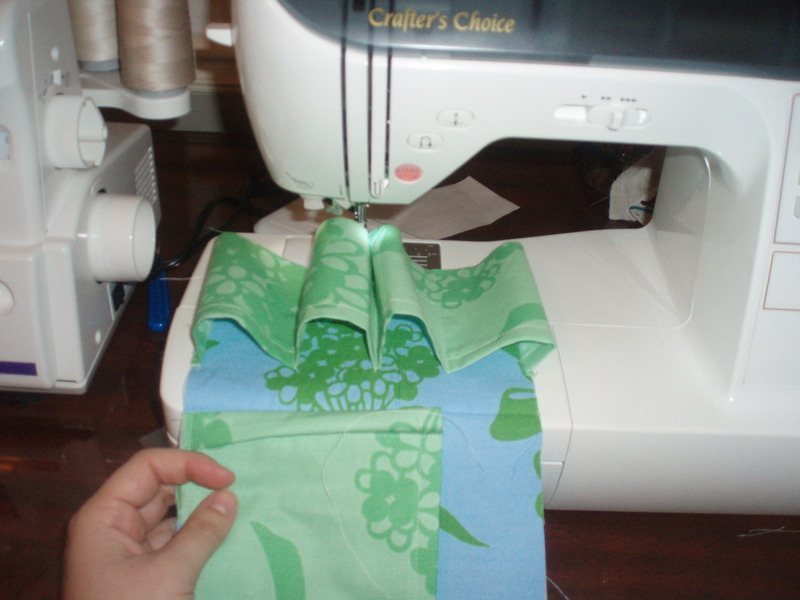 Sew around the edges, using a 1/4″ seam allowance. 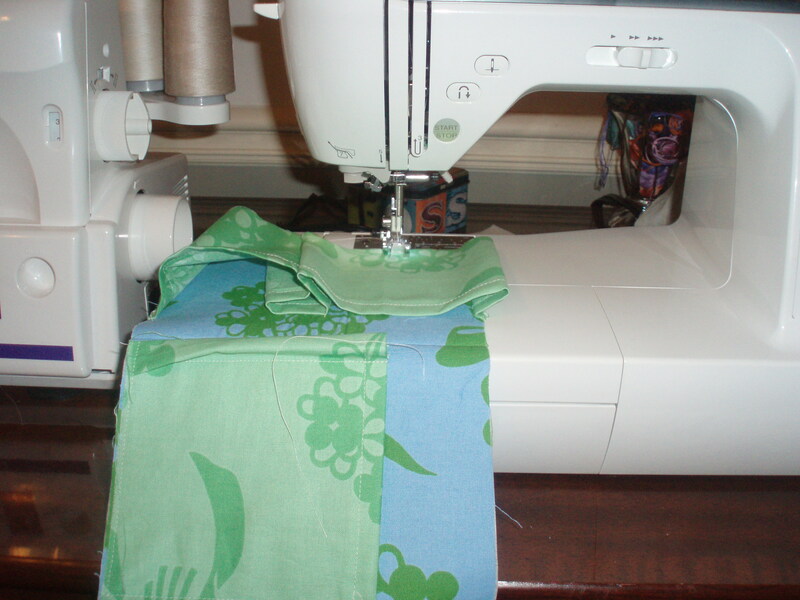 In the corners, leave your needle down, lift the foot, rotate your work, and continue sewing. Leave a small hole to turn. (I make sure mine is at the top, about the paper/pencil pocket. I don’t like leaving a hole where the pockets are joined. (A picture of the hole I left.) Clip your corners, so they’ll end up being corners and not large bumps. Push out your corners, straighten your work. Press your wallet. Admire it. Smile at realizing you are so very close to being done with this! And another look at the finished interior. Fill the crayon pockets with 8 crayons. Put a small pencil (I use Zebra brand mechanical pencils) in the pencil pocket. Place a 3.5″ x 5″ pad of paper in the paper pocket. (Just place the cardboard back in the pocket, leaving the paper available for coloring.) The messy pleats make it really easy for toddlers to get their crayons in and out of the wallet- giving them a good lesson in keeping their own things neat. (I was shocked when my 2 year old, who never puts anything away, sat and put every crayon back in its place before reaching for another.) You can feel free to use, change, or laugh at my design in any way you wish. Happy crafting! Previous Article Moose and Wormy: For Free! You are so cool! I think it is awesome that you are so crafty! Thank you so much for posting a free tutorial! I’ve searched on google for about 30 mins for a free one and the only one I can find is the one you mentioned for $7. I can’t wait to make this for my daughter! I second Kristen’s comment; I couldn’t find anything else on line for making these, and I love your step-by-step! Far from laughing at your free design, I thank you and soberly take heed from your experience with mock-ups. I, too, would have thought this is “just a bunch of rectangles,” so I am sure you have spared me a lot of frustration. I will be making a set of these for my son’s birthday party as take-home loot! Thank you so much for the sewing instructions!! They were clear and easy to understand. I now can make wallets for my daughter’s birthday party as favors. Thanks again. Thanks so much for this wonderful tutorial! Such easy to follow directions and great pictures meant a success on my first try. I will definitely be making more of these! I just wanted to let you know I have finished making a crayon wallet from this tutorial and WOW! Thank you! All your instructions were so clear and the photos were extremely helpful. I really, really appreciate the time and care you put into this tutorial, it definitely shows and now I have a beautiful wallet to keep my little boy entertained while we’re out and about. Thanks again, so very much! Hi, I was just wanting to know if the paper on the heat bond stuff gets peeled of at any stage or does it stay on? Thanks heaps, your wallet is fantastic! 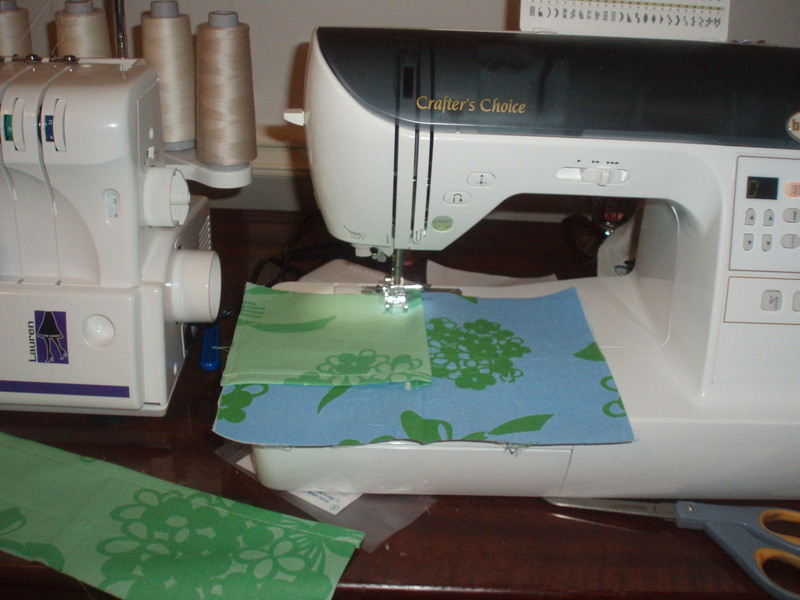 I use heavyweight fusible interfacing, so there isn’t any paper. (You buy it by the yard at Joann’s or Hobby Lobby.) It isn’t heat and bond, which had the paper on both sides because both sides “stick”. 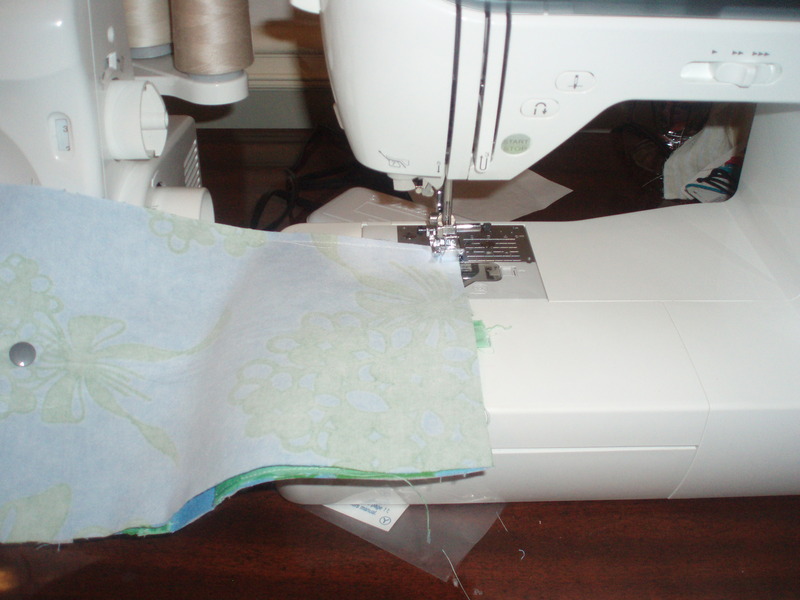 The interfacing only has one fusible side. 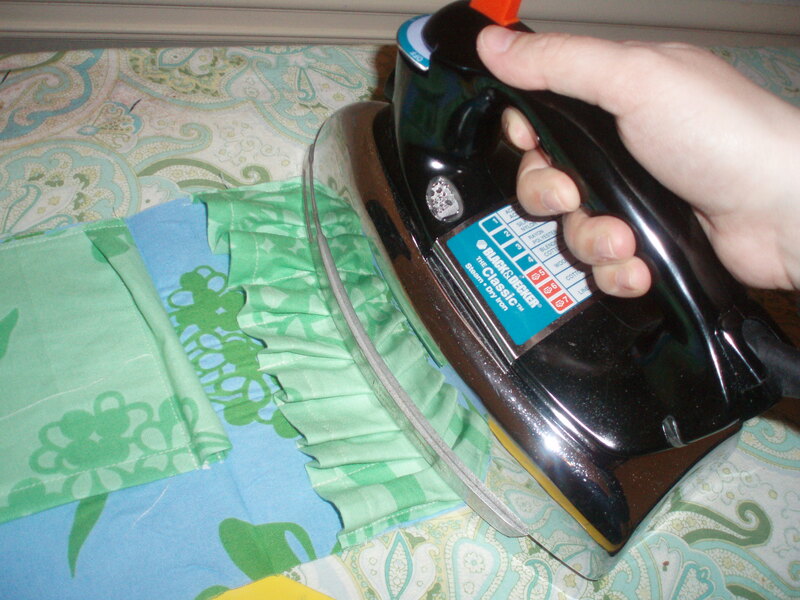 I typically iron it on with a tea towel between the iron and the interfacing, just because that makes it iron on more smoothly. Once it is ironed on, the white interfacing feels like soft flannel. Hope that helps! thanks. 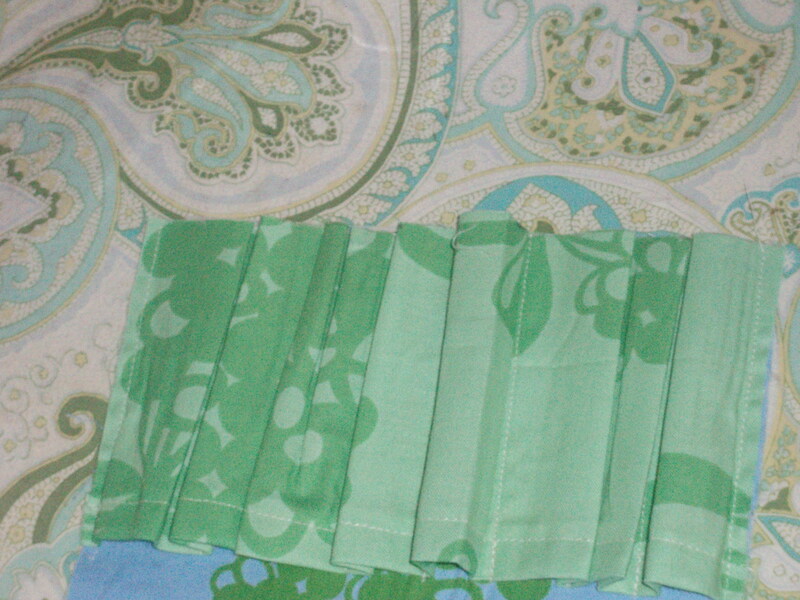 i bought one of these at a craft fair thinking i could make a pattern from it, but i could not figure out a way to get the pleats right. i love love LOVE the halves. totally my style crafting! thanks heaps and Merry Christmas! Finally made this today after eyeing it for a long time. Just wanted to say thanks for the tutorial! 🙂 Appreciate you taking the time to share! Thank you so much for the tutorial. I thought the same as you that I can figure it out, but after seeing your tutorial I would have missed a step or two. hahaha. thank you for not charging me $7. Thank you so much for the tutorial! My only question I have was what is the finished dimensions of the inside if you didn’t mind sharing? I want to make mine big enough to slide a small clip board into it on the paper side and it measures 6″Wx9″L.